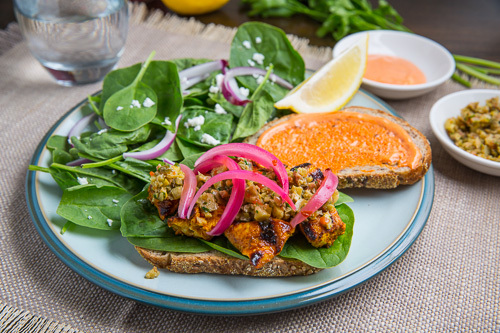 A tasty Moroccan grilled chicken sandwich with preserved lemon tapenade, pickled red onions, spicy harissa mayo and baby spinach. When I made the Moroccan grilled chicken the other day I made a double batch because I wanted to ensure leftovers so that I could make some sandwiches. I am sure that some of you saw something like this coming when I wrote about the green olive tapenade with preserved lemon and pickled red onions since I always use ingredient recipes in another recipe shortly after. 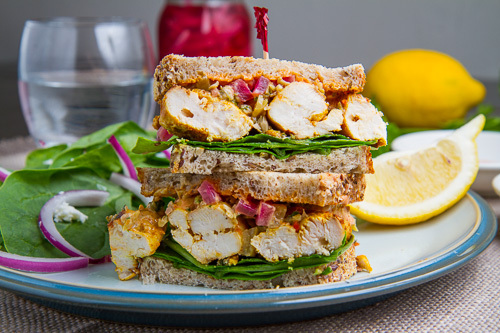 This sandwich has been on my mind for a while and it is just packed with flavour from the Moroccan grilled chicken, lemony and salty tapenade, creamy and spicy harissa mayo and tangy pickled red onions all of which is on a bed of tender baby spinach leaves in whole grain bread. 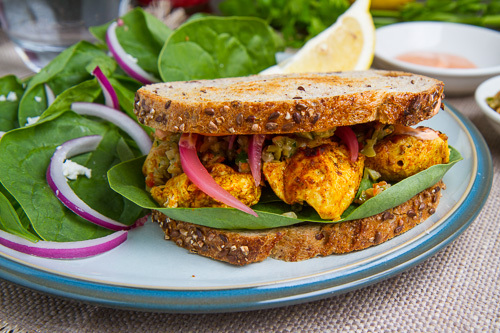 This is definitely one tasty sandwich and it is well worth the effort of making the ingredients! Note: For harissa mayo mix 1 tablespoon harissa into 1/4 cup mayo. You are so creative with ethnic foods!! I have been searching high and low for a simple moroccan recipe to make and then here you are today! This sandwich is incredible and I honestly can not wait to make it! This sounds delicious!! Great sandwich! Perfect sandwich for a picnic! Another amazing sandwich! Wish we were neighbours! We could trade sweet for savoury? What an awesome sandwich! I would be delighted to find one of these in front of me at lunch! Marian (Sweetopia): That sounds like a great idea! Yummers!! I'm loving the Harrisa mayo! That mayo and that lemon tapenade…I want those on everything! Great ideas Kevin!